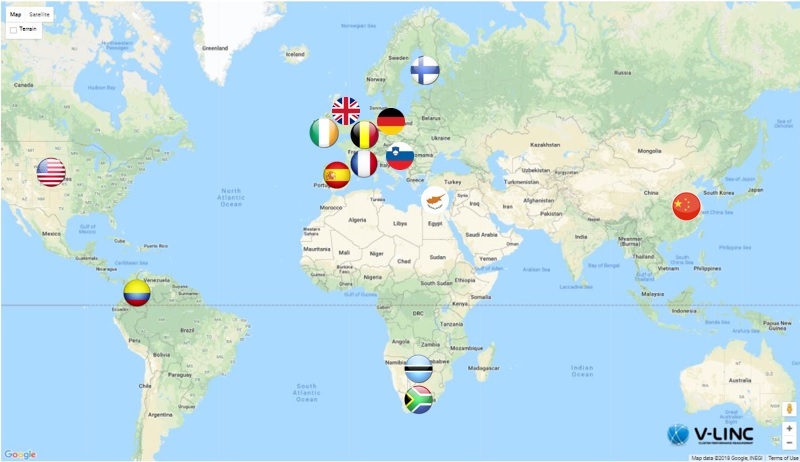 The V-LINC research group has experience working on European and Nationally Funded Cluster projects across the following countries. The Consortex project - European Internationalisation Maritime Consortia in the shipbuilding & ancillary industries. The initiative is funded by the European Regional Development Fund (ERDF) through the Interreg Atlantic Area Programme. The project has a budget of €1.6 million, over 24 months and seeks to improve the competitiveness of the shipbuilding sector in the Atlantic Area. The Consortex project, is led by Fórum Maritimo Vasco (FMV) based in Bilbao, and has partners from the five Member States of the Atlantic Area Programme (Portugal, Spain, France, Ireland and UK). The partnership includes; Fórum Maritimo Vasco (Bilbao, Spain); Fórum Oceano (Norte, Portugal); Associação das Indústrias Navais (Lisbon, Portugal); Cork Institute of Technology (Cork, Ireland); National Maritime (UK) Clúster del Sector Naval Gallego (Galicia, Spain) and Bretagne Pôle Naval (Bretagne, France). organisation systems, improving knowledge and commercialisation, and training staff of the naval sector in technologies. The project is lead by Diputación Provincial de Pontevedra (Spain); and the partnership consists of Bretagne Pôle Naval (France); Cork Institute of Technology (Ireland); Fórum Oceano (Portugal); Asociación Cluster del Naval Gallego (Spain); University of Strathclyde (United Kingdom); Foro Marítimo Vasco (Spain) Pôle de Compétitivité EMC2 (France); Asociacion de Industriales Metalúrgicos de Galicia (Spain) and High Speed Sustainable Manufacturing Institute Ltd. (United Kingdom). ecoRIS3 - The V-LINC research group was awarded the Interreg Europe ecoRIs3 project in January 2017, and we are also the Communications Leader for the international consortium. ecoRIS3 addresses the transfer of innovation and knowledge, produced by both Research and Technological Organisations(RTOs) and Higher Educational Institutions (HEIs), to all types of Enterprises. This important connectivity frequently demonstrates gaps which can be a brake on overall levels of innovation and growth. The ecoRIs3 project addresses the clear need to promote better policies and measures, which generate solid interactions and knowledge transfers, between key research and production actors. Among the activities to be delivered are a series of Regional SWOT Analyses, Exchanges of Experience and Good Practices and Policy Recommendations (https://www.interregeurope.eu/ecoris3/). Be Wiser (Building Enterprises – Wireless and Internet Security in European Regions) is a 36 month project funded under the Seventh Framework Programme (FP7) of the European Commission. It involves twelve partners from seven European countries and aims to strengthen the research, innovation potential and global competitiveness of European regions by bringing together research actors, enterprises, institutions and policy makers into a collaboration network. Lead partner is Systematic Paris Region (www.be-wiser.eu). The Resource Efficiency Maritime Capacity Project (REMCAP) is a 36 month project funded under the Seventh Framework Programme (FP7) of the European Commission. It aims to increase innovation capacity in maritime resource efficiency to better position the maritime sector to exploit the growing global demand for resource efficient technologies, systems and operations. REMCAP is a collaborative project with a total of 14 partner organisations from six European Regional Research Driven Clusters (www.remcap.eu). The V-LINC analysis was applied to the Agri-food sector in West Cork, Ireland, as part of a project commissioned by Cork County Council through the ATClusters project (www.atcluster.org) in collaboration with the West-Cork Development Partnership.